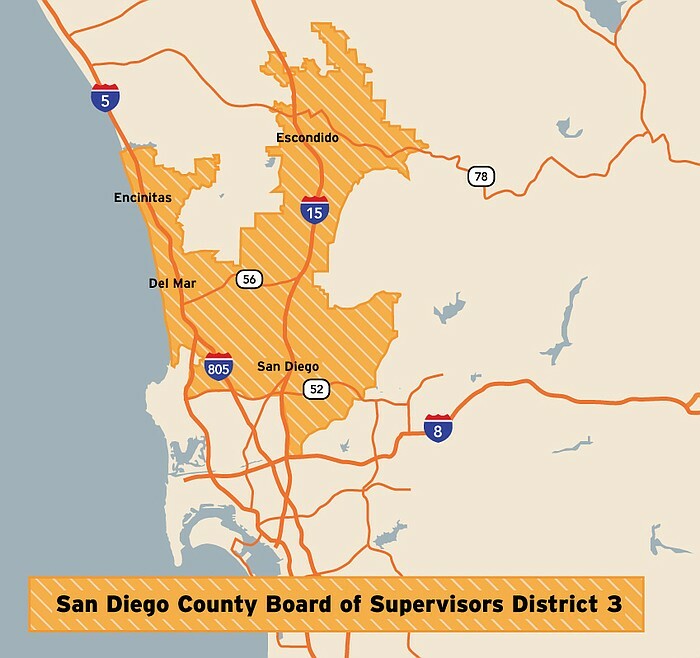 How desperate are Republicans to regain the District 3 Supervisor’s seat on the San Diego County Board of Supervisors? VERY DESPERATE. But the hand it has been dealt with Kristin Gaspar as its standard bearer is really pretty poor. Gaspar’s performance as Encinitas mayor has been undistinguished. The only issues she personally has initiated have gone pretty badly. Gaspar proposed to address homelessness by sending $100,000 of Encinitas-city funds to the Escondido-based Interfaith Community Services rather than contribute those funds to the Community Resource Center in her home town to support the same type of program. Since Gaspar was running for supervisor against the Escondido mayor Sam Abed at the time, could that have been a political move to sway voters in Escondido? The remainder of the Encinitas City Council rejected that give-away. Instead of passing the offer to the staff for proper evaluation, she grandstanded by bringing it straight to the Encinitas Council without even the courtesy of asking the County how it felt about their library being renamed. There, she demonstrated lack of vision, creativity, and competence. The result was a unanimous, awkward public rejection of an offer from a generous community member. On several occasions, Gaspar has claimed undeserved credit for passage of important city issues for which others had fought for years but for which she had initially opposed or done nothing substantive. In primary debates, Gaspar displayed appalling ignorance regarding county issues as well as a general lack of knowledge on government procedures. Roe served as a senior advisor in Marco Rubio’s recent campaign, and was deputy manager for Romney in 2007. He has supported conservative candidates in third-world countries like Nigeria, Liberia, Bulgaria, and Iraq. Now, Roe is managing another “third-world” candidate. Revolvis’ charges are already $117,000, using up more than half of Gaspar’s contributions. His advice: Safe, superficial performances rather than debate appearances – except at the Downtown Rotary Club (not even in Encinitas, her home turf), even though multiple dates have been offered by the debate sponsors and the League of Women Voters. Think that downtown venue will be helpful in enlightening district voters? You betcha! Also expect big negative PAC-funded signs and mailers, which characterized Gaspar’s previous campaigns. Is she unprepared and afraid to answer questions? Do her handlers fear her performance would do more harm than not appearing? That approach worked in Encinitas. Let’s hope the bar is set higher for Supervisor. Please compare her empty record with Roberts’ full record and see who can really do the job. At $5 billion, the budget overseen by the five-member San Diego County Board of Supervisors is bigger than the city of San Diego’s. But elections for county supervisors often fly under the radar. The only seat being seriously contested this year is the District 3 seat held by Dave Roberts, the lone Democrat on the board. Other Interests: Coaches Pop Warner cheerleading squad, third grade civics instructor. Other Interests: Hiking and spending time outdoors and at the beach with his family. 1 Comment on "Supe race limbo: How low can it go?" As a resident of North San Diego County and Encinitas I want to say that Dave Roberts has made a huge difference in our area. He has assisted dozens of local non-profits to obtain grants, has attended their events, and has been an excellent steward of our lifestyles, quality of life, and promoter of our beaches, arts culture, and education. Gaspar has no legacy for Encinitas despite her years on council and 2 years as mayor. She was on one committee in her total time “serving” Encinitas and did not even attend the one scheduled meeting. She claims she “put sand on our beaches” but it was Teresa Barth that did all the work. She claims “she balanced the budget” when it is not the council’s job, it is City Staff’s job, she claims she “was responsible for the Hall Property sports park” she was not on council at the time the vast majority of the decisions were made, she made only two proposals in all this time One was to have Encinitas fund a non profit in Escondido (bet you all would have loved that – doesn’t it reek of vote pandering) when we have the same services offered in Encinitas to the same audience, the other was to name the Encinitas Library for one of her financial backers. She is for developing the Lilac Hills project and adding 1,700 + homes in a fire prone area despite her claim that she is for fire safety. She will make sure every developer who is funding her gets their wishes by making North San Diego County resemble to unabated growth of Orange County. Kristin only attends the sporting events that involve her kids. I’m sure she is a very nice gal but certainly not a good candidate for this important position. Dave has earned the next term.